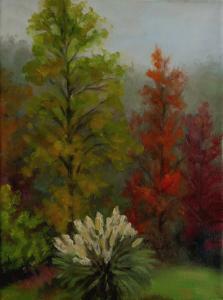 Vicki has been creating oil paintings for 30 years and studied fine art at the University of Southern Indiana. After graduating with a degree in Fine Art, she moved to Minneapolis and took classical drawing and plein-air painting classes through The Atelier, a fine art school that taught nineteenth century French painting and drawing techniques. Vicki soon began teaching oil painting classes through adult community education, as well as out of her studio. In 2004, she and her husband moved to Santa Fe, New Mexico, where she began painting large sky paintings of the beautiful sunsets of the high desert. Her paintings currently are shown in two galleries, Convergence Gallery in Santa Fe, and Conley Studio Pottery in Madrid, NM. 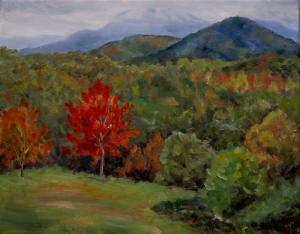 In North Carolina you can see her work in Saluda at Kathleen's and in Flat Rock at Gallery Internationale. 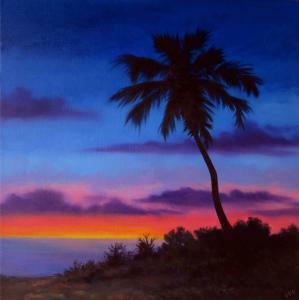 She now resides in Tryon, NC, and continues to paint the skyscapes of the Southwest, along with landscapes.